Why Should I Choose Vinyl Fencing for My Home in Richmond? If you’re looking for a fence that will never rot or rust, vinyl fence is your ideal fencing choice in Richmond. Vinyl is perhaps the fence that requires the least amount of maintenance, which is great for busy homeowners who have other home improvement and maintenance projects to work on. Not to mention that vinyl is durable, affordable, and customizable, all of which make it a fencing solution that’s hard to beat. Learn more about vinyl fencing in Richmond in our blog! One of the biggest draws of vinyl fencing is its ease of maintenance. Vinyl is a non-porous material, which means water can’t get into the material and cause decay or oxidation like it can with wood or metal. Plus, this non-porous quality means that paint won’t stick to vinyl. Color is added during the manufacturing process, so you never have to worry about painting your fence, or anyone vandalizing your fence with spray paint. It really couldn’t be any easier to maintain a vinyl fence. Just a quick wash with soap and water and a rag every once in a while is all you’ll need to do. Vinyl is actually a very customizable material, and can be manufactured to look like other materials such as wood. With vinyl fencing in Richmond, you can get the look you want without having to worry about maintenance. With lots of color and style options, you’ll find what you’re looking for with vinyl. Vinyl won’t warp, rot, or splinter. UV inhibitors are added during manufacturing to prevent fading from the sun’s rays. Vinyl is practically impervious to the effects of the weather, which is especially great in a place like Richmond that gets all four seasons. 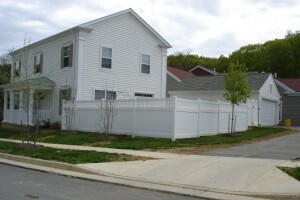 Interested in installing a vinyl fence for your home or business in Richmond? Contact Hercules Fence of Richmond. Hercules Fence of Richmond has been providing professional fence installation and service in Richmond for more than 50 years. Call us at (804)752-7992 or contact us on our website to learn more about residential and commercial fencing in Richmond.